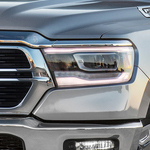 Has the Ram 1500 caught your attention? It is a popular light-duty pickup truck among consumers because it offers a number of features. At Robert Green Chrysler Dodge Jeep Ram, our team strives to provide our customers with detailed information about our trucks. Let's look at a few capability features that come with the Ram 1500. With the Ram 1500, you can choose the available 5.7L HEMI V8 engine with the eTorque Mild Hybrid System. This engine provides you with best-in-class V8 combined fuel economy and best-in-class V8 towing. This engine has a maximum towing capacity of 12,750 pounds, and it can reach 395 horsepower and 410 lb.-ft. of torque. The class-exclusive Active-Level Four Corner Air Suspension System is an available capability feature that you can get with the Ram 1500. This system will lower automatically at highway speeds for better efficiency and reduced drag. If you choose a model without this suspension system, you get a class-exclusive active air dam that will automatically extend downward by 2.5 inches for enhanced efficiency and reduced drag.